I came up with that mantra approximately 8 months ago and it seems to be challenged on a daily basis. I rather enjoy the challenge because it helps foster the concept and reinforces the need for sticking to it. It is a rather simple phrase that is incredibly difficult to achieve. Too many times people are satisfied with their accomplishments. Now, before anyone goes off the handle about the need to celebrate accomplishments every once in a while, I believe there are always small victories in achieving the right answers and solutions. But those victories should not be seen as absolute accomplishments. They should be seen as one of many steps on a path to achieve greatness. This post is a result of a fascinating experience during my first day back to class. I am taking classes in leadership and strategic management. 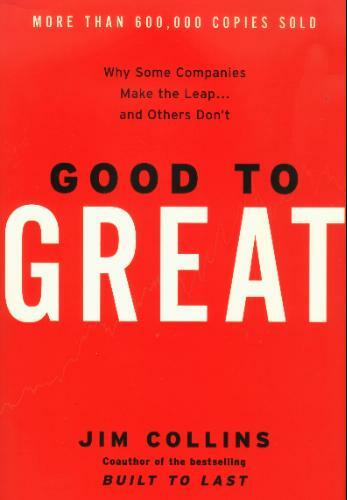 My leadership class has prescribed the book Good to Great. I have read this terrific work by Jim Collins five times. Each time I read it, I glean a new piece of information from it. Today I realized that Good to Great can be applied to every aspect of a persons life, not just business. My most recent application is to my executive masters education program. The program has bestowed a significant number of truly great instructors. Even so, there are instructors that fall into the not so great category. I met one of those instructors today. It made me realize that no matter how hard I reach for my goals, there are people and circumstances that are simply out of my control. As described in the book, it is important to get the right people on the bus, the right people in the right seats, and the wrong people off the bus. That is exactly what I plan to do. There are people riding the bus I’m on who are in the wrong seats or don’t belong on the bus. I cannot control whether or not they are removed or moved, but I can control which bus I ride. It would be comfortable for me to site back for the next 13 classes and be satisfied with good enough. However, that is not the right thing to do. Over the next week, I will stand up for what’s right. I will begin to gather the right people on a bus and determine the best way to drive it to achieve a common goal. I am surrounded by the right people. They need to know that I am interested in going on a trip with them. We don’t know where this bus will take us but it will surely be a better place with the right people taking it there. Keep in touch to know more about our adventures. This entry was posted in Business, Ownership. Bookmark the permalink. The wheels on this bus will go round and round.